During my recent visit and involvement with teacher training programs throughout some rural parts of Nepal, I did a lesson on writing, both in schools and during training sessions. Writing about Writing illustrates the process I go through when I teach writing. In this article, I have tried to outline the steps I take while teaching writing for both younger developing writers and older more experienced emergent writers. When I teach writing, I teach it as a process because that is the way that I view it. Writing involves planning, writing a draft, editing and revising and publishing. It takes practice to develop your skills as a writer; it just doesn’t happen overnight. To begin with, when I work with students, I do several things that vary only with the age and skills that my students have. First, I activate prior knowledge by having students brainstorm the different ways that they use writing. Younger students generally talk about the notes they write their moms or the handwriting practice they do while older students talk about lists, taking notes, writing letters or now-a-days, texts, and writing stories. Activating prior knowledge is important because students need to become aware that we use writing in many ways and for many different purposes. After brainstorming about how we use writing, I model my own writing so that my students see me as a writer. For example, if I am asking students to write about themselves then I share with them the process that I go through when I am writing about me. It is important that students watch the process of writing so that they know that this is a process that all writers go through. Again, this process is planning, draft writing, editing and revising, and then publishing. By orally describing my picture and labeling, I am showing my students the picture/word association and also giving them some ideas about how they can do their own picture plan. I would also include some discussion with my students about their own families, who is in it, where they live, what they like to do, ect. Before letting students go off and do their plans, again, giving some guidance for their plans. Then I would set them free to draw their picture plans about themselves, their families, where they live, the things they like, and any other details that they might like to add. Picture plans work well for kindergarteners, first graders, and other developing writers. Older students generally have more language and can use a different type of plan. Generally, for older students I use a circle map, which is a type of thinking map; thinkingmaps.org. A circle map has a frame around it that guides the writer’s ideas. The frame is usually divided into four sections which can vary dependent on the topic you are writing about. A beginning piece about themselves might be framed with things like: Facts: name, age, family members, where I live; Things I like; My Favorites; and My Goals or things I’d like to get better at this year. Using a plan like this allows students to jot down their ideas before they begin writing. Students then list the answers for these questions or topics in the different areas of the circle. I try to remind them not to write out complete sentences in their circles because this is just a plan and that draft writing is when they put their ideas into complete sentences. Just as I did with younger students, I model my own plan and go over it with them and then show the students how I moved from my plan to my piece of writing. For this assignment, I give the direction that they are to write at least one paragraph about themselves using information from their plans. As students finish their plans, my job as a teacher would be to go around and have them describe their picture plan to me so that I could help them label it. I would encourage students to label what they could beforehand and share their plan with their neighbor, but I would try to get around to all the students to help them label and add any extra details. Planning might take a whole class for some students but for others, it might be quick and they might be able to continue on to the next step- draft writing. My directions for younger students might vary dependent on the age and development of their skills as a writer but usually I would give a direction for students to write 1-3 sentences about their picture. My goals for younger students are to get them to write so I accept invented spelling and look to see that they are generating some sentences that give me information about their picture. Conferencing with students, I might point out spacing issues, handwriting difficulties, but primarily I am focusing on their ideas. “Wow, I see you wrote that you like to play with your dog. What is your dog’s name? Can we add that to your sentence? Good job.” I like to think of a “Star and a Wish” when I am giving feedback. Writing takes practice and it is important to praise what a student is doing well rather than focusing on the things they need to correct. If I see many students having the same errors or difficulties, then I use that as a teaching point and do a mini lesson the following day about whatever the issue was, or I say, “Today I am going to be looking for good spacing between your words as you write” to draw their attention to something I noticed was an issue previously. If my students need more support to generate their ideas then I will use some patterned sentence starters to help them. For example, I might put on the board the following pattern: My name is ____. I live with _____. I like to_____. I might also have a mind map that I’ve done previously with students to list things they like to do; again, the idea being that they have a list of words already generated that they can use for their own labeling or to add additional information to their sentences. When I model my paragraph, I point out that I didn’t use all my details to make my paragraph, but if I wanted to use all the information then I share with them how I could write a multi-paragraph piece of writing that included all the information from the plan. I show students both models of writing, (one paragraph and multi-paragraph) and then provide them with models of patterned sentences/paragraphs that they can use for either writing one paragraph or multi-paragraphs. These are written out on charts and hung on the wall, or they are written on sentence strips and put in a pocket chart for students to see. I also talk about topic sentences, (main idea sentences) that begin a paragraph and let the reader know what my writing is about. Then I talk about closing sentences that end my paragraph by summing things up or by adding an emotion to it. I add this in the form of a sentence starter and label it with either topic sentence or closing sentence. We also spend some time brainstorming aloud some other ideas for topic sentences and closing sentences and if needed, this is organized as a mind map for students to see and choose from. Now, my students are ready to begin the process of writing at least one paragraph about themselves. First, they plan and I go around and comment on their details and ask a few open-ended questions where necessary to encourage them to add to their ideas. I also might make my own connections to their ideas to reinforce to them that I’m interested in them. For example, one student writes that purple is her favorite color, and I say, “Oh, purple is my favorite color too; how cool is that!” As the purpose of this writing activity is to help me get to know my students, it’s important to connect with them about common or shared interests when and where I can. After students finish their plans, they can begin their draft writing and can use either the patterned sentences model for one paragraph or the multi-paragraph model to help them write, if needed. Again, I rove and comment here and there on something they’ve written, but I don’t use this time to correct, unless a student is asking me something specific. When their drafts are done, then I set up a writing conference with them, and that is the time to point out some things that might need fixing up or to emphasis some details that might be needed to strengthen their writing. I still use the idea of a star and a wish to guide my conferencing, and I don’t overcorrect. By pointing out something that they are doing well with their writing before adding a constructive point for them to think about, I help my students recognize their strengths in their own writing while also encouraging them to look more critically at how they can strengthen their writing. I also try to get students to read back over their writing first before coming to me or to share their writing with a neighbor or a friend first. I want to be able to help them self edit and do revisions on their own. I also look for common errors and use them as a teaching point for a mini lesson the following day. If I have students who are more proficient with their writing skills, then I use my conferencing time to extend their writing. Some things I might do are to to ask them to select at least two sentences to revise by adding more details using adjectives, adverbs, or other figurative language such as metaphors or similes. I might also ask students to select a few sentences and add more details by adding the word, “because” to let their readers know why they like something or like to do something. Combining ideas and varying their sentence structures so that they start their sentences in different ways to improve the fluency of their writing might also be something to conference about. How I use my conferencing time with students is dependent on their skills and needs. As with writing, everyone is different; however, taking the time to conference with students isn’t. It is an important part of the process. It takes time, but it is important for students to get that one on one time with you to look more critically at their own writing. When conferencing is done, students go back and revise their writing to produce a final draft, which is their published piece. Whenever possible, I encourage them to word process this or to hand write it neatly and if time, to add an illustration to it. We share our published pieces with the rest of the class, so students know that their work is valued and then it is posted in our Writer’s Corner for others to see. Celebrating their work helps students see that writing is important and something to be proud of. A saying I like is, “Writing is Power.” If you can write well, you can do anything. Teaching writing is something I’ve done for many younger and older students. While the topics and content may vary, the process for teaching writing is generally the same. Planning, developing their ideas, drafting, and then revising and editing before publishing are steps that all writers take with their own writing. By modeling and providing structure and guidance, students of all ages learn how to develop their own skills as writers. They also learn to appreciate that writing is a process and an important one. The Author: Doreen Richmond has taught at all grade levels in the USA. She was a Special Education teacher for many years and currently teaches Reading and Writing in the Transitional Learning Department at Whatcom Community College in Bellingham, Washington. Recently, she has been involved in a teacher training program in Solukhumbu, coordinated by REED Nepal. It has been well experienced that academic writers can rarely be “self-dependent” in discussing or explaining ideas in the course of developing some thesis in any field of inquiry. Instead, ideas or insights are generated and developed by making reference to the works (including research finding, theoretical proposition, or any sort of written description, etc.) of previous authors. In this connection, one can summarize the points stated by the previous author and carry out critical analysis, synthesize the propositions of some authors, identify the lacking/gaps therein, and then refine the proposition/s by adding new insights. Or, one can even come out with a different perspective to look into the existing phenomena so that new propositions are established. While doing so, acknowledging the previously done works and the respective authors who had contributed therein is one of the common minimum academic cultures that everybody should maintain in doing research as well as writing academic papers. Accordingly, this tradition has been established in the world more or less everywhere – for academic as well as professional practices in universities and publication houses. However, some differences are found in the style of reference citation in the written text and the way of writing the authors’ names in the reference list that is usually placed at the end of the text. In this post, I am particularly raising the issue of crisis in author identity that has been created as a consequence of a particular ‘style’ of work listing in the ‘reference’ section of academic papers, research articles, books and dissertations. When someone writes and publishes any material with his/her name, we need to understand that the very name that appears in the paper is his/her identity. Needless to say, the author has the willingness to be identified publicly with the name as appeared in the print; and it is a matter of honesty on the part of the subsequent writer/s to regard the previous authors by their respective names and surnames without any sort of intention to misinform the readers and without causing injustice against the author to the extent of losing his/her identity. In this connection, I would like to draw the attention of the respected audience towards a question which should be considered a genuine one in the academic world, which is: How can the authors’ identity be properly respected while recording their works in the subsequent academic writings (when the previously produced source is consulted for reference purpose)? We must answer this question before deciding the style of making a list of works cited in the text, because some of the formats that are in widespread use in the ‘academic market’ have not been able to do justice in favour of authors as regards their identity. Usually, the key information about any work to be listed in the ‘Reference’ section of a research paper includes: author, year of publication, work title (book, article, journal, dissertation, or any other document), the place of publication and publisher. We can be in a very comfortable position to say that there should not be a problem in any of the styles followed in making the reference list if the list contains these key things in the entry. Despite this, it would be relevant to raise serious reservations regarding the ‘style’ which deliberately reduces (and thus disregards or even undermines) the identity of previous authors by ‘abbreviating’ their first (and middle) names – which is an unwanted action for the original authors, and even objectionable from the point of view of their identity. In the past, when I prepared academic articles, my reference list had duly honoured the authors whose works were cited in the text by entering the words carrying their identity as appeared in the respective sources (i.e. full names and surnames if the author mentioned so, and ‘abbreviated’ names only if the source itself contained the author’s identity like that). After the articles were submitted for publication in different forums (journals in particular), many of them have been published without reducing the previous authors’ identity. But, in some of them, the editorial team has taken the ‘action’ of identity reduction by abbreviating the initial and middle names – in the name of following the APA format and maintaining uniformity in the style of all writers in the journal. A reference entry of this kind, in addition to doing injustice against the identity of authors discussed above, has also caused confusion among the mass of readers in properly recognizing the author. For instance, when someone quotes a sentence or phrase from an article written by Ram Ashish Giri and writes ‘Giri, R. A.’ in the reference entry, there is no point to ensure that his/her readers will, without confusion, understand that ‘R. A.’ stands for ‘Ram Ashish’! Instead, ‘R. A.’ can be understood by readers as any name beginning with R and A in the case of the first and middle names respectively (e.g. Raj Ashish, Ram Anish, Raj Avatar, and so on). Such a style, in this way, has not only reduced the authors’ identity but also misguided the readers more or less intentionally. Interestingly, although such a style (which is in widespread use) does not allow the authors’ full recognition in the reference list; it has clearly instructed the writers to mention the complete name of the publisher. In this connection, the attempt of giving full recognition to the publisher should be well appreciated, but there is no point in disallowing authors’ full recognition. And, there can be no reason why authors’ identity should always be hidden on one hand and the curious readers should be left in confusion on the other! The essence underlying the discussion so far is that we must have author acknowledging and reader friendly attitude; otherwise we cannot create an encouraging environment for academic and professional prosperity, growth and development. In absence of the willingness to make correction in style (with the aim of preserving author identity), the culture of intellectual exploitation can sustain forever under the banner of academic works such as publication and research. The academia throughout the globe needs to be aware of such a practice – which is not simply a matter of style but essentially a sort of academic offence against intellectuals. Steps need to be taken towards stopping such wrong practices so that the environment of academic honour can prosper towards right direction. For many, writing can be a very vulnerable and challenging process. However, with certain skills and motivation, an aspiring writer can come up with creative and interesting text which can engage readers from the first word to the last. 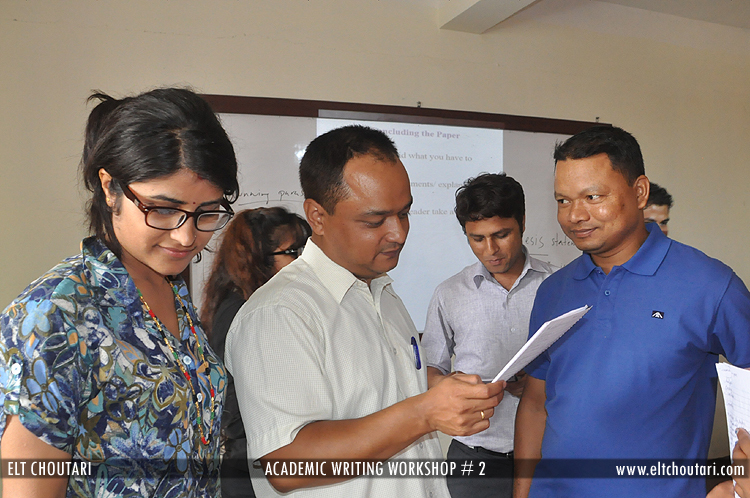 With a view to enhance the writing skills of English Language Teaching (ELT) practitioners and emerging writers, ELT Choutari organized a writing workshop titled “A Performative Endeavour in Academic Writing” on August 23 in Kathmandu. Hem Raj Kafle, assistant professor of Kathamandu University School of Engineering, and also one of the founders of ELT Choutari, facilitated the one-day workshop held at King’s College, Babarmahal, Kathmandu. Twenty emerging authors, especially teachers and students studying English from Kathmandu University and Tribhuvan University attended the program. Sharing his experience as an established writer and a prolific blogger, Kafle highlighted on significance of different components that make one’s writing interesting, authentic and reader-friendly. 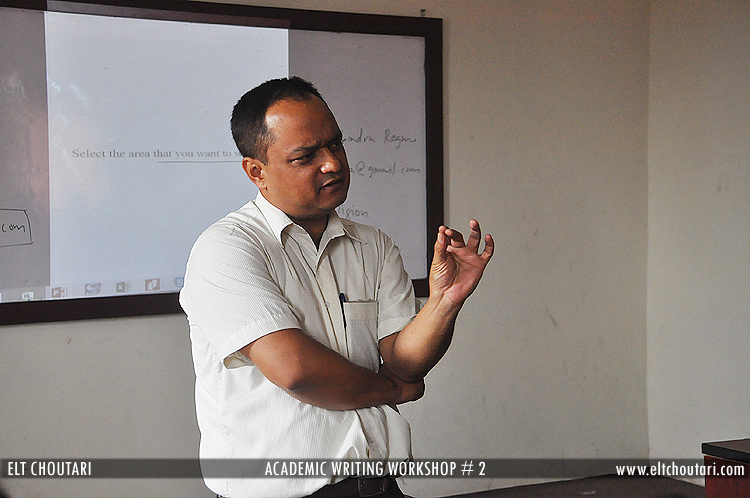 He divided the workshop into a series of sessions and shared some practical techniques on how to overcome writer’s block, how to start with effective beginning, argue with different elements, establish the writer’s presence, and so on. Toward the end of the workshop, facilitator Kafle illustrated few examples of different models of same writing and through comparison, the participant writers were engaged to scrutinize those pieces of writing and pick the effective form based on the analysis. “The workshop was very helpful for me as I want to write articles about drama and theatre; and get them published in newspapers,” said Deepesh Paudel, one of the participants from Sarwanam Theater. 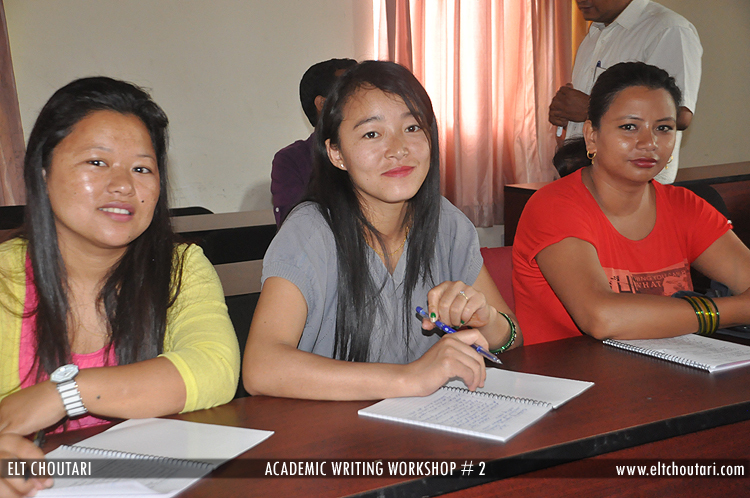 Similarly, Usha Kiran Wagle, one of editors for Choutari and an M. Ed in ELT from Kathmandu University, reflected about the workshop saying that she has gained new confidence in writing. This monthly writing workshop is a part of ELT Choutari to promote professional development of English language teachers through networking and building on local resources and knowledge in English language teaching. ELT Choutari organized a workshop titled “Problematising, Organising, Introduction, Conclusion and Abstract while Writing Papers”at King’s College, Babar Mahal in Kathmandu on July 26, 2014. 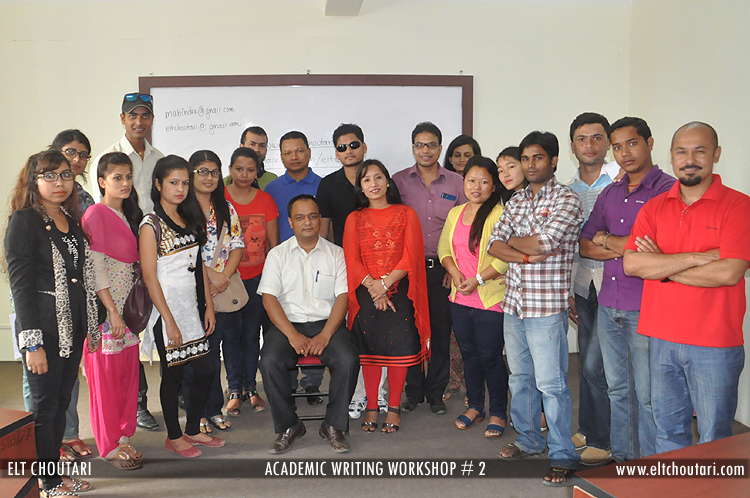 Mabindra Regmi, an adjunct lecturer of KU School of Education, facilitated the one-day workshop, attended by 18 writing enthusiasts – teachers and students from Kathmandu University and Tribhuvan University. 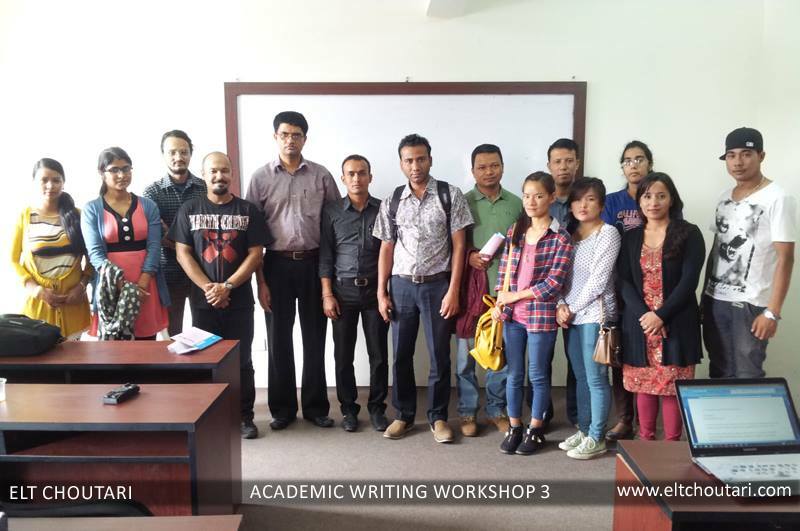 Regmi talked about why many researchers and novice writers get ‘stuck’ while writing the introduction, conclusion and abstract of papers and research article; and he walked through the workshop giving tips and guidelines on how to get over the obstacle. Regmi involved the participants in brainstorming and problematizing/contextualizing their interest area. Then the participants came up with a draft of the introduction for their topics and got involved in a feedback session. When I graduated from my high school, I thought I was a great writer. I had written for countless assignments and examinations. I had written poems and stories. I had scored relatively high marks in English during my high school final examination. How could I not be a writer? It was a bitter shock when reality crashed in and I had to redefine my so called ‘expertise’ in writing when I faced the challenge of writing a proposal for an educational endeavor. I spent many a night poring over the proposal and scribbling on a piece of paper in that pre-ubiquitous-computer era to keep my inflated writing ego alive.